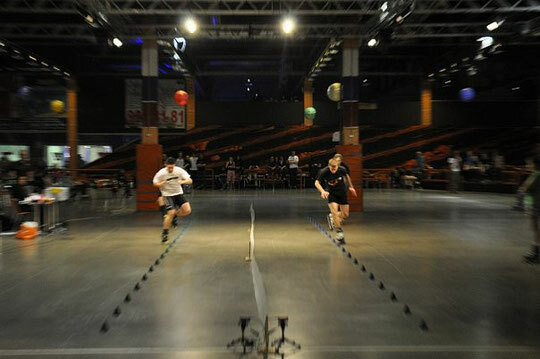 The second edition of Battle SPB took place during the same period and on the same spot as last year’s – March 13-14, at the Lider Roller-Rink in Grand Canyon retail and entertainment complex. 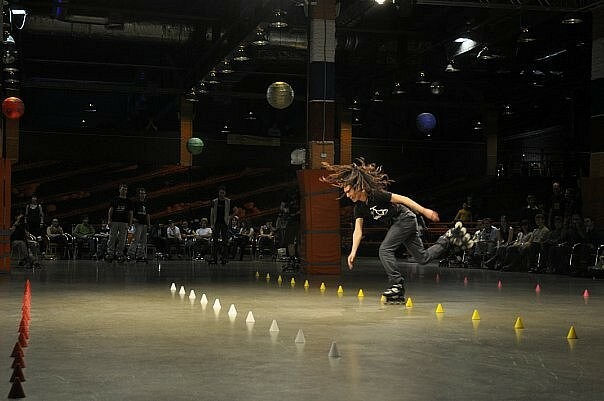 The event was promoted this year, becoming a three-cone Battle – the first main event of the season, the real kick-off for 2010. In 2009, SPB was just a warm-up for the main event of the following week in Moscow, but this year there’s no rehearsal! As we had arrived by night-train the day before, like most skaters, we had time to become acquainted with the ground during a long session. Please note: a noticeable improvement in the organization concerning the DJ – compared to last year’s Drum’n Bass DJ. I do have to mention it. It was a classic standard schedule with, on Saturday, the speed slalom categories (qualifications and KO systems for both women and men) and the first qualification round of the Mens Battle; and on Sunday, the Mens and Womens Battles. Lots of spectators came by, thanks to the location of the rink, and thanks to the same strategy as last year’s consisting in leaving the rink open to free skating. The speed slalom category would have been quickly set and done if not for the Cells strike in the middle of the Womens Qualifications. It was only after long negotiations that the judges eventually made them see reason, and then we could resume the competition. There were just seven girls: three Russians, three Ukrainians, and one French. • Only the first four qualified for the KO Systems which started with two Semi-Finals: KO #1 between the first and the fourth qualified, Kristina Lysenko (RUS, #5 – best time: 5.15) and Marina Boyko (UKR, #16 – best time: 6.24); and KO #2 between the second and the third, Chloé Seyrès (FRA, #1 – best time: 5.36) and Ksenija Komarchuk (UKR, #36 – best time: 6.19). • The two favorites win their semi-finals in two winning runs. They meet in Final: a close final (running around 5.8) but Chloé Seyrès wins the final, being slightly ahead without penalty, against Kristina Lysenko who ends up second. • The consolation final is won by Ksenja Komarchuk after three runs: she was cleaner than her opponent Marina Boyko. • The first eight of the qualifications go through to the KO Systems. • The semi-finals promise to be impressive, given the casting. However, just like in the quarter-finals, the two Italian favorites Tiziano Ferrari and Simone Nai Oleari eliminate their opponents Kim Sung Jin and Andrei Shitov in two winning runs – the last two being slightly behind and a bit less clean. • The two knocked out meet in a two-run consolation final as close as clean: both runs are won by Kim Sung Jin who thus gets the third place: 5.52 against 5.6 with one penalty for the two skaters on the first run; and two perfects, running in 5.44 and 5.47 on the second run. • The first two of the qualifications meet in Final, a final 100% Italian between Tiziano Ferrari (#1) and Simone Nai Oleari (#11), who had won against Tiziano at Battle Busto (Ita) the previous week. Tiziano can’t rival the times of his opponent, and despite two perfects (5.33 and 5.27) doesn’t manage to catch up with Simone who runs faster than 5.2. • Fifteen women had registered, including four non-ranked and four in the world’s Top-10: The French, the four Ukrainians and an overwhelming majority of Russians. They started hostilities with hectic quarter-finals. Only two out of the four quarter-finals unfold without a hitch, with the skaters ranking according to the logical order of the world ranking. • In Group #4, the jury requires a best trick to decide between the second and third places: Natalia Sannikova (RUS, #NC), though non-ranked, knocks out Maria Nikolaenko (RUS, #29). • But the most striking coup de theatre takes place with Group #1: Yulia Kulagina (RUS, #35) challenges World #1 Chloé Seyrès (FRA, #1)… so that a Best Trick is necessary to determine who will get the first place in the group: a Best Trick won feet hands down by Yulia Kulagia managing a Seven on 7 cones – against Chloé Seyrès who does a sitting trick combo. As Chloé Seyrès ends up in second position in her quart-final group, and according to the cross-chart goes to the bottom of the chart (i.e. she finds herself in the second group of semi-finals instead of the first) – the situation upsets the prognostics of the group organization. • In Group #1, Yulia Kulagina (RUS, #35), Marina Boyko (UKR, #9) and Sabina Ismailova (UKR, #22) don’t do things by halves! 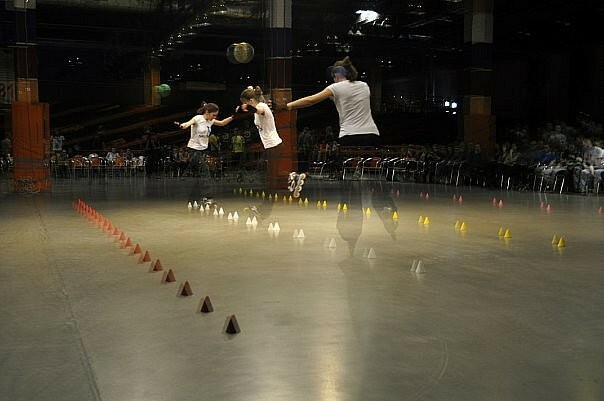 Marina Boyko, ends up far above thanks to well managed wheelings (transitions in every way, mastered sevens…) completed by technical spin combos (normal and switch) and sitting tricks, which she has improved since last season (kasakspins, christies, footgunspin). It was between Yulia Kulagina and Sabina Ismailova that the fight was close: who among the Russian whose technical level rocketed during winter (double wheeling transitions, sevens front and back, specials one foot, etc.) and the young Ukrainian, controlled and reflective, will have the last trick word? According to me it’s no big surprise that Sabrina Ismailova is selected for the final, thanks to technically less daring runs, but far cleaner and better mastered. Yulia Kulagina will become dangerous once she is able to handle competition stress. 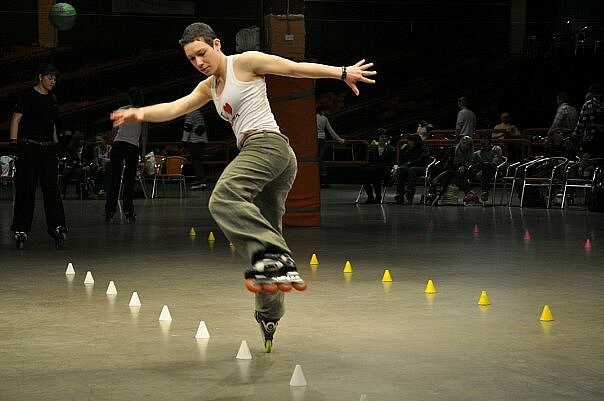 Unsurprisingly, Angelika Babiy wins the round – she is used to skating in finals so she can handle stress better than her opponents. She is followed by Kristina Lysenko, who, despite a (very) bad fall during the quarter-finals, holds out with a bruised knee. Yulia Kulagina ends up third (seventh at the general ranking)… her performance doesn’t yet match with her potential in trainings… but her opponents should beware: Nadezhda Zelenova’s relief is already on her way! Natalia Sannikova, the non-ranked Russian, finishes at the eight general place for her first battle. • Theoretically, the die is somewhat cast for the first place… though actually everything is still to be done: amongst the four finalists, Marina Boyko has a far better mastering of wheelings than the other three, Chloé Seyrès, Polina Semenova, and Sabina Ismailova… but she still has to manage them! 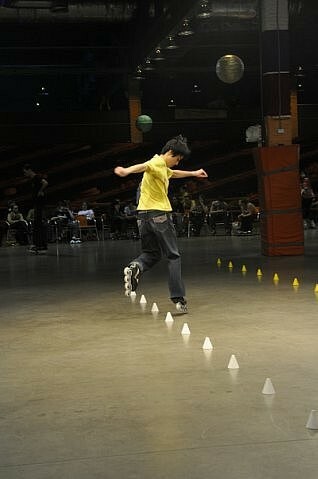 • In the end, she is the one who wins the 2010 Edition of Battle SPB, and beyond dispute: Marina’s wheelings are not as well mastered as usual, but she is still technically high above her opponents (back heel wheeling on 20 cones for her last trick). 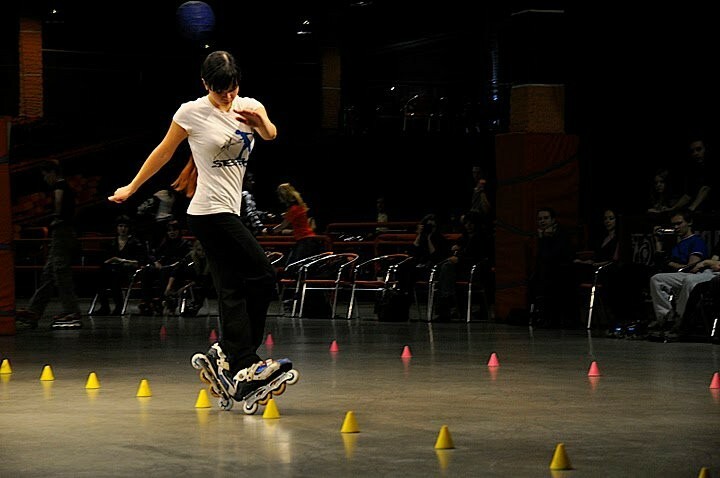 The verdict is as follows: Chloé Seyrès ends up second – clean combos, except for a little tangling in the third run, a four-cone seven, and a mastered heel wheeling transition 1x5x4 (back-front-back); Polina Semenova ends up third, not having managed to do her wheeling-esque performance of the semi-finals again; and Sabinal Ismailova ends fourth. The Battle had already started the previous day with the First Qualification Round, to cut down on skaters for the real fight of the morrow. They were 36, amongst whom seventeen were in the world’s Top-50 – and six in the Top-10 – and five were non-ranked. • Nothing much to say about this first round, except that in Group #10 (out of 12) Viktor ‘Generator’ Meleshkevich (RUS, #16) shows two weak runs, which relegates him to the second qualifying place behind Alexey Tsokolov (RUS, #50). • During the Second Qualification Round, the group rankings remain predictable – if that! Half of the groups’ second places were tough to get: Boris Rozbroj (FRA, #43) the Poulain of the King of Style is knocked out by Mischa Gurevich (GER, #29) ; Ivan Misevra (RUS, #89), a very promising Russian who has been skating for two years only, is knocked out by the above-mentioned Alexey Tsokolov who didn’t twiddle his toes thumbs during winter; and Kirill ‘ReKiL’ Ryazantsev (RUS, #22) with a clean and technical old-school skating, is knocked out by Viacheslav ‘Slavka’ Syniushko (UKR, #36). Describing the Semi-Final Round as a slaughter is not far from being a euphemism. The losses, though predictable, are heavy: end of the game for the French Xuan Le (not technical enough) and Igor Cheremetieff (who has given his all during his excellent quarter-final); Martin Sloboda, Dimitry Shevarutin and Kim Sung Jin qualify for the Final – despite lower revs for KSJ. The vacant qualifying place for the final is played out between Rudy Op’t Veld and Shitov: two same-scale performances (made of varied and technical set combos)… hard to choose between the two… but it’s Rudy who gets the winning ticket for the final. The consolation final gathers the disqualified of the semi-finals: Andrey Shitov, Roman Gordin, Xuan Le and Igor Cheremetieff… a Franco-Russian fight, organized in two runs and one last trick. The two French pull themselves together and end up ahead of the two Russians: two well-deserved fifth and sixth places! 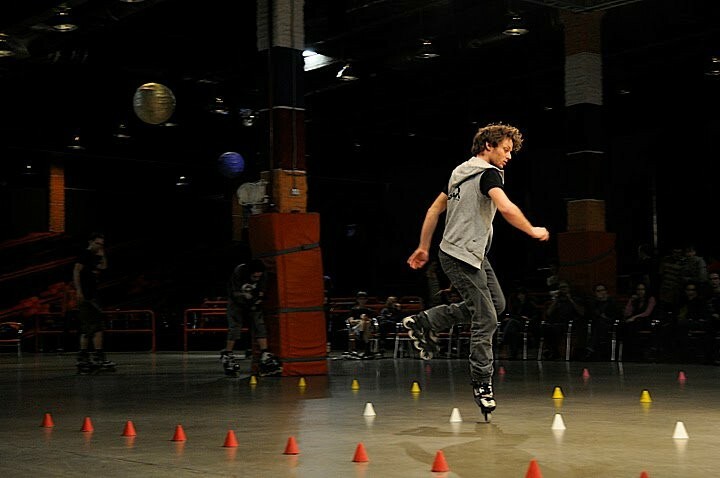 • Igor Cheremetieff skates cleanly and carefully, and finalizes his tricks (chalk and cheese compared to the way he skated during his semi-final). He shows a varied panel of tricks and ends up first of the round to his credit. • Andrey Shitov completely misses the round, his runs are muddled and he doesn’t manage most of his tricks. He is relegated to the fourth place. • As for Roman Gordin, his disconcerting ease in wheelings (he can even afford – doing wheeling – to pull up his jeans in order to be comfortable for his next trick) is not enough to compensate for his lack of variety. Battle Saint-Petersburg 2K10 men final from rollercontests on Vimeo. The four finalists are in the world’s Top-10… a heavy final! • Kim Sung Jin handicaps himself with a missed first run… he makes up for it the best he can on his remaining two runs. 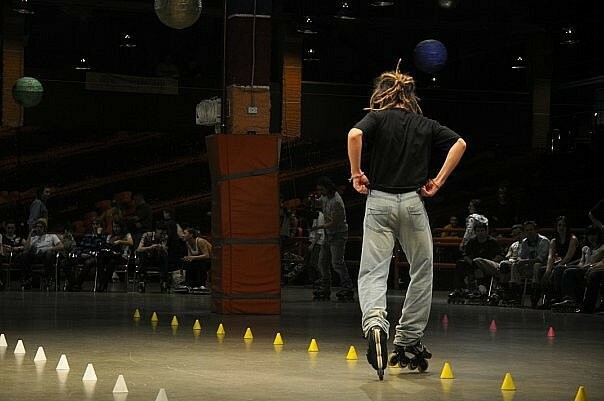 It’s a shame, though, that he didn’t manage his combos as well as during the preceding rounds: combos made of back heel wheeling to heel sewing-machine (normally repeated ad vitam aeternam), wheeling to special on foot, day-nights to wheeling… but two good runs and a huge last trick (20-cone special one foot, stabilization, and here he goes again for 6 cones of special one foot) are not enough to catch up… he ends up behind Martin Sloboda. • The third and fourth places are close, between Dmitriy Shevarutin who shows signs of tiredness and Rudy Op’t Veld who does a good performance with self-made combos at a high rate of success: sitting tricks, double wheeling transition, various spins, a little bit of style, but a last trick a bit weak compared to that of his opponents (a 9-cone back heel wheeling launched from a 6-cone special one foot). It’s Shevarutin who, despite the fact he missed his last run, gets hold of the third place, thanks to super-technical combos (special one foot to butterfly to sewing-machine managing a dozen of cones) and thanks to a nice last trick: special one foot to toe seven – managing the whole line! Let’s hope that next time will be worth two! See you next Battle: Friday and Saturday 19-20 March 2010 at Adrenalin Skatepark in Moscow!